You remember, staying home from school, sleeping on the couch with fuzzy blanket and your favorite stuffed animal clutched to your chest. Mornings filled with cartoons and afternoons with dramatic soaps. Along with the comforts of home came the smell of chicken soup wafting from room to room, filling our senses not only with stimulation for an appetite, but also with love. Home with a cold. Or, as we affectionately call it in the medical field: a symptom cluster. One that includes stuffy nose, headache, runny nose, sneezing, coughing, scratchy throat, malaise and fatigue. We've all had it. Some say as many as 200 in a lifetime. Cold viruses have been around for millions of years and have learned a thing or two about how to take advantage of our weaknesses. Americans catch more than a billion colds a year and spend billions of dollars to treat them. The typical medicine cabinet houses a dozen cold remedies. Most are over the counter items that have partial boxes or bottles remaining with dosages left in them. From year to year, the great hope of a panacea always springs eternal. Why is the common cold so common? What we have learned in recent decades about cold viruses has revolutionized our understanding of them. No single agent is responsible for the cold, but an army of agents. The common cold is the result of viruses... at least 200 different ones. Five families of cold viruses have been identified and the Rhinovirus is responsible for the symptoms in more than 40% of these adaptable critters. 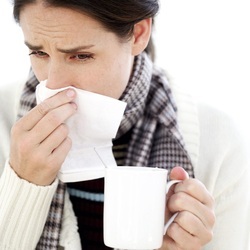 While some people get infected and have a raging case of cold symptoms, there are those who do not. Is the common cold an ailment that is poorly understood? Research has found that it is more common to contract the cold virus from our partner, our children, or those who we share proximal living arrangement with. The goal of a virus is to reproduce and survive. Rhinoviruses are perfectly adapted for survival. Their hosts are up and about, sharing runny noses and unwashed hands at home, at work, school and on shopping carts. With the long, fruitless search for a cure, the common cold is still as prevalent as ever. The best solution to the common cold is to prevent it altogether. People have tried all kinds of things, some scientific, and some not. In the 1500's, sufferers applied a poultice of onion and garlic to their throats, gargled with malt vinegar, soaked the feet in cold water, placed a nutmeg in each sock, tied a locket of iodine on a silk ribbon around their necks. And, even the most straight-laced of them took a swig of hot whiskey mixed with all of the popular ingredient suggestions. In 1922, the Chemical Warfare Service gassed hundreds of patients for cold and other respiratory ailments in a small room infused with chlorine vapors. Even our very own Calvin Coolidge lined up to take advantage of this "treatment" that surely did more harm than good. This much maligned weapon of war became the favorite treatment for colds, bronchitis and whooping cough practically overnight. Vitamin C has gained tremendous attention over the years and many a study has come to inconclusive evidence. In 1970, Linus Pauling was so convinced that this wonder-vitamin could not only prevent, but also minimize symptoms of a cold, that he suggested that it be supplied by the National Health Service to the general population. However, the the medical establishment decided against this. Today is no different. Each season, new cold remedies surface, touting "fast relief from the worst cold symptoms." Not a single one will prevent or cure a cold. Sometimes symptoms are allayed. Sometimes, not. General over-prescribing of antibiotics, cough suppressants, and cold medications have become the standard. Even though, study after study shows no efficacy of these. The typical pattern of sneezing, runny nose, headache, cough, congestion, malaise, fatigue, and slight fever usually runs its course in about 3-6 days. The earlier we take action to quell the symptoms, the easier and quicker our recovery will be. When one's immune system is strong, the cold virus will come and go with little more than being slightly annoying. Our body's ability to cooperate with nature will bring about more relief from those symptoms than all of the analogous cold remedies put together. At the end of the day, the best people can hope for in a cold remedy is a significant reduction in symptoms. While there is no "cure" for the common cold, medical herbs may be our best options for mitigating symptoms without causing the typical side effects of over the counter and prescription medications such as drowsiness, over-drying of membranes, nausea, vomiting, trouble sleeping, dizziness, headache or nervousness. Customized medical herb formulas take hold at the root of our biochemistry and change our inner landscape to one this is inhospitable to a virulent. Customized medical herb formulas also reduce swelling, decrease inflammation, congestion, phlegm and mucus, moisten throat and membranes and provide digestive relief without unwanted results. Because the biological effects of medical herbs have their therapeutic context in dosage, scheduled timing, weight and height considerations, metabolism, absorption and distribution of the constituents, a customized prescription of an herbal formula can only be compounded by a qualified Chinese herbalist. A qualified Chinese herbalist provides a modern scientific approach to individualization of care. With this model, there is great efficacy of treatment. Colds come and colds go. We retreat to our room, sip hot tea and eat chicken soup. Nap, read and daydream. We surrender to the visitor, in hopes that our bodies will be a little stronger for it. Once the cold has stayed its welcome and moved on, it is easily forgotten. Life settles back into a routine. Until next time. If you are just getting a cold with minor symptoms, or you have been sick for days or weeks and can't seem to get better, come see me for a customized medical herb formula that puts you on the road to recovery.